As is the case with all early proof type coins, Bust quarter proofs are both rare and survive in tiny numbers. Yet, an ample run of proof Bust quarters exist of both the large-size and small-size type, providing deep-pocketed early type collectors with plenty of challenges. Most proof Bust quarter issues survive with few representative specimens, most often numbering fewer than 5 to 10 pieces per date. In many cases even fewer of any single date remain, as is the case with the 1820 proof Bust quarter, which has just 3 known survivors, or the 1823/2, which has just 1 known survivor. Conversely, the 1827/3 original strike seems counts around 10 known specimens and an 1827/3 restrike has about 15 known survivors. 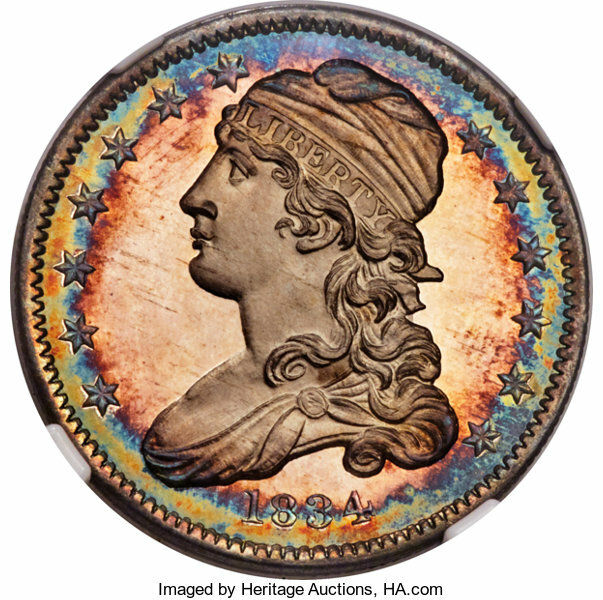 Even the later small-size Capped Bust quarters are rare in proof, with about a half dozen or fewer specimens known for any of the proof issues. While rare as a class, many of these early proof quarters exhibit stunning surfaces and, in some cases, gorgeous cameo contrast.